We are pleased to be the first practice in Greater Cincinnati to offer our patients the latest technological advance in prenatal imaging ? four-dimensional ultrasound. This innovative technology shows your developing baby in greater detail and in motion, giving your doctor important diagnostic information about both you and your baby. Patients receive a CDE-ROM and DVD of their child?s earliest movements. We are offering four-dimensional ultrasound for those parents who wish to know more about what to expect during their unborn child?s development. This high-resolution imaging, with real-time movement, complements traditional two-dimensional image or your baby providing ?live action? motion which appears similar to a video. The 4D ultrasound technology can give you a whole new view of your baby and provides additional diagnostic information to help your doctor evaluate your unborn child and your pregnancy. A 4D ultrasound requires the same time as a traditional ultrasound, from 20 to 30 minutes, depending on a number of factors, such as the position of the baby and amount of fetal movement. This is a non-invasive exam that typically does not require any special preparation. Your doctor will advise you if ant are needed. No, this is a safe way to look at your baby. Ultrasound technology is based on sound waves sent into your body. Their return echo helps generate the image. Our staff will provide you with keepsake photographs along with a CD-ROM and DVDE of your child?s earliest moments. While insurance companies continually review new diagnostic imaging technology, this ultrasound system is not yet covered by most plans. Payment is due in full at the time of the imaging. 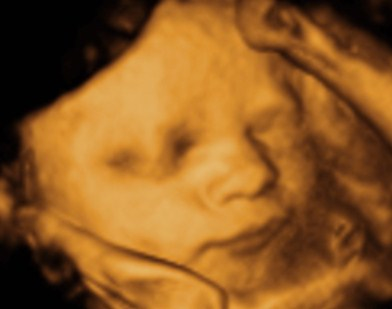 We offer the 4D ultrasound at our Mt. Auburn office on The Christ Hospital campus in Mr. Auburn, as well as in our Mason office. Please call 513-241-4774 to schedule an appointment.